The current puzzle count is 440. As expected in the previous update, over the past week or so I went back and worked on the endgame again. I built an original version of the endgame last summer; I had one friend playtest it, and it worked out pretty well, though I felt it wasn't quite epic enough. I didn't know what more to do with it at the time, so I just let it sit, and went to thinking about other parts of the game. Lately I had more ideas for the endgame, so I went into personal crunch mode and rebuilt into something more epic. This was one of the most productive periods of my working life (maybe the most productive) and I think this area, all taken together, may be the most interesting thing I have ever designed. However, it may be a little too difficult for the player, at the moment! Today I playtested this endgame and one other area of the game, with a game designer friend of mine, and it took nine and a half hours to play through these two areas (6 hours for the endgame, 3.5 hours for the other area). I think this is a little long, so I am going to be tuning these areas and cleaning them up a little bit. This weekend hopefully I can get in some playtest time with Jeff and Casey of Jeff and Casey Time, so if that happens we will see how it goes. Meanwhile, on the art side, we've been working on the style of the game; expect a future blog post as we come to conclusions on that. Tech-wise, Andy has been working on performance stuff. First he made raycasting much faster; til now the game had been relatively lazy about spatial organization. Andy implemented a quadtree for finding entities in the world and enabled k-d tree generation and serialization for casting rays against individual meshes. (We had k-d tree code already as part of a library but weren't using it.) Salvador is working on in-game animation playback, as well as exporting; until now we have been making do without animations, but once this is in the game it will help us with a number of issues. Nine and a half hours? This is gonna be huge! Awesome but what does clean mean here ? and why would you remove too difficult ones from the game? I don’t know that I would remove them entirely, but I might take them off the main path from “finishing the game” and make them more optional. Part of the reason is pacing. The Witness is not about difficulty, it’s about the interesting ideas that come up as the subjects of the puzzles. If someone spends half an our figuring out one puzzle one time, that is probably fine; if it happens 4 times in a row, that kills that pacing of idea flow. I actually like difficulty in games, and I am sad that most modern game designs are about faking difficulty; the challenge here is just how to structure the difficulty so that it doesn’t mess up the game in other ways. Great that’s best choice I see taking them off the main path but not removing them completely so they don’t hinder the pace. Can you please tell if there is any subtle storyline element in “The Witness” like “Braid”? or there is some mystery element in the game that encourages player to solve these puzzles… what’s the motivation? or is it shear joy/fun of solving these puzzles. 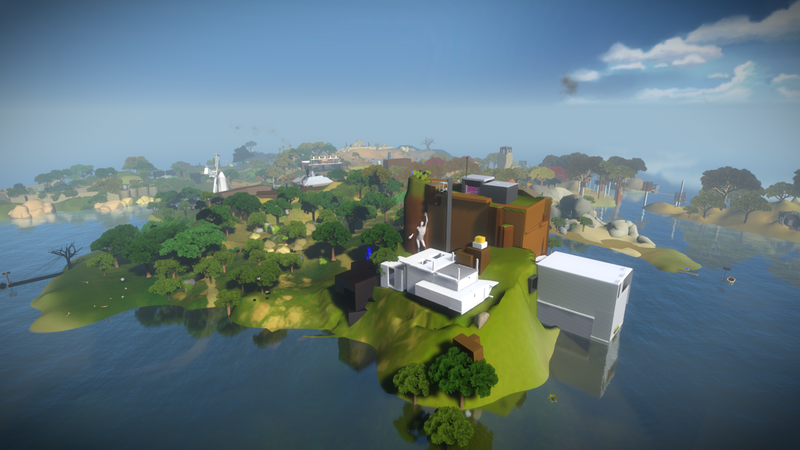 Pranshul Chandhok: Just like Braid The Witness has a story. What we know so far is that you are the solver and witness and you are in the island guided by the designer. while in the island, You solve puzzle made by the designer (we don’t know who he is), witness natural phenomena and try to solve the mystery of 1. why you are there. 2. who you really are. 3. people that have been there in the past. 4. cultures and archtectures of past. 5. find a way to wonder and question the unioverse in a serious way. that is all we know so far. but story varies by part of island you are on. mix with the designers personal experience like: he was ugly and bold and he change the way he thinks about looks. this part is about uneven features or something so the designer had uneven facial features and stuff like that. Is about putting things together in oportunistic wyas. get it Pranshul Chandhok? Thanks justin that sounds cool but how did you come to know that much about the game? You must make the most difficult games to playtest. Imagining my experience with Braid as a playtest is ludicrous. One puzzle maddened me for days until one night I woke up sweaty and anxious; I couldn’t remember my dream, but I immediately went and solved the puzzle. Conclusion: Almost, but not quite, too hard. Damn you Jonathan… I can already hardly wait to buy your game, why must you tease me so! The endgame sounds massive. And if you think it’s the most interesting thing you’ve ever designed, then it must be awesome. Braid’s last level was already good enough, I can hardly imagine how great this will be. I’d love to play a 10 hour puzzle game. I know in one lecture you hoped people would be happier with shorter games in the future and not measure price to length as a factor for score. I agree but I have no problem sitting through it. Maybe go for a similar method with the stars in Briad i.e. if the player wants the game to be harder, it can be. In film making we have a saying ‘films aren’t finished, they escape’. maybe it’s true with games as well? I would love to playtest it , maybe, it might damage the experience of when the final product is released. I know that won’t be backgroud music in “The Witness”, but I just want to write that the ambient music made by Brain Eno matches this game. I ‘ve been following this blog for– has it been a year now?–and have never felt the need to comment up until this post. I wouldn’t be surprised if you were already a fan, his approach to music (and art) have some parallels to much of what you’ve preached in all of your interviews/panels. The album which immediately comes to mind is “Thursday Afternoon” (consisting of a single song). I highly recommend reading the wikipedia article on the album http://en.wikipedia.org/wiki/Thursday_Afternoon and giving it a spin–it’s available on Spotify. Please seriously consider him or at least reach out with the concept. He’s always struck me as an individual open to almost anything provided it is interesting. As seen in the picture, will the corners be darker than the center of the screen? I also wonder what a “productive period” is and how long does it last. How long was this productive period? How long did you work on this for and why was it the most productive? If you care to share. It’s a combination of being inspired and having the discipline and motivation to sit down and do a lot of work, day after day, not go out and do social stuff or anything else that eats time, etc. Part of what made it maximally productive is that I was following up on the ideas as quickly as I humanly could; I think clearing them out in this way provides space for new ideas to come in, and for those old ideas to evolve into better versions of themselves while you are still “in the zone”. So you pretty much where doing noting but coding, avoid being social or seeing anyone, avoided being interupted and being very productive… I get that but… How long this did period last? A whole day, a whole week, more than that? I’m curios what you call a working period. What is the longest you have isolated yourself to get something done? I mean complete isolation. Wow, sounds really incredible! I had been wondering about the 10-15 hour thing after you hit the 400 mark with the puzzles. I could be slower than the average gamer, but I probably spent a good hour on some of the puzzles in braid! Of course, much less than that on most, but even still… If the average puzzle solving time is 5 minutes, even discounting the time spent walking around, that puts the game close to 40 hours! Of course, it’s silly to measure games by hours since everyone will take a different amount of time, and besides it kind of implies the attitude that the goal of playing a game is to “beat it”. Anyway, I’m very glad to hear it will be a large game. I think the average puzzle solving time will be substantially less than 5 minutes; most of the areas are designed with flow in mind. However, I haven’t measured this, so I could be totally wrong. We will see! The sky and atmosphere look beautiful in this image. I feel like this game is starting to look truly stunning, more and more like a place I would love to get lost in. At least that’s my impression from this angle. Also, I like the sound of “rebuilt into something more epic.” That’s a good sound. This all being said, it’s refreshing to see a game in which potential length is not an obstacle, but embraced as a part of how extensive the initial idea can be. I think a lot of designers these days go into their projects fearing making something that is too long, because of some preconceived fear that their idea isn’t interesting enough to hold the audience’s attention.. Which is part of why I’ve become increasingly dependent on independent projects as of late. Dear Esther, for instance, was a fantastic example of a game being as long as it needs to be. It, realistically, lasted 90 minutes as an experience, but the overall emotional impact has proven to be something far greater. If each puzzle can be unique in some way, and the Witness stretches to a 20, 30, even 40-hour experience, then I don’t think length is something to worry about. If, conversely, you feel parts are too challenging or stale, then perhaps they have no place. Either way, the world these days is sorely lacking in games which engage the human imagination, allow us to freely explore, and do something the medium has altogether never seen. The Witness is an easy day-one purchase, at least for me, and unquestionably many others who feel the same. So, yeah, I know, it’s “done when it’s done,” but I’m just going to pencil it in for next Spring… I’ll skip the iPad 3 and I’ll buy the iPad 4 just to play this game!! Can’t wait to play this, next year, if the world is still here. I really like hard games. Sure flow is good, but I’d be really happy if there were some hard as hell puzzles on the side you could like go and stare at once in a while and think about while clearing the rest of the game. Wow this looks incredible Jonathan. And 400+ puzzles? Wow. Definitely a day 1 purchase for me. It’d be interesting to see the current end game as a sort of extra/bonus feature in the game, for interests sake. At 6 hours, it sounds incredible. I remember JB saying that they hope to get the game to release on much weaker platforms than your PC is. I would assume yours will run the final game just fine. Update: Casey played through all the same playtest material (but, revised / slightly streamlined / fixed up) in 3 hours. So that’s quite a spread so far! Hmmm, that’s interesting. Any thoughts as to the cause of the discrepancy? Nice to hear the game is producing new ideas and that you’re still excited about it this far past prototyping – really eager to play it. When you mention that 9 hours, that’s not you playing it, right, but your playtester? From what I’ve heard the core of the game is discovering the rules and solutions to the puzzle panels and how they relate to larger contexts in the game, so I assume you as the designer could probably breeze through it. Or does the endgame break into a different type of gameplay? I volunteer to playtest the game sight unseen. I like the idea we’re learning about the designer, especially if it plays with our assumptions. Maybe the designer had a handicap like Django Reinhardt. Maybe halfway through building his puzzles he suffered a tragedy and it changed his style. Who knows? Exciting! Or maybe the designer begins to go mad and become less comprehensible. Then to solve the puzzles you will begin to go a bit insane yourself? Only to find out… that you ARE the designer. I can’t help but wonder… What if Old Man Murray made a video game… and then reviewd it… ? Please, PLEASE! Bring this game out to the xbox 360!!! I loved Braid!! I love your games because there SOO original!! You have soo much talent, man! Don’t exclude some of your fans! Let everyone experience it!!! Thank you very much for discussing your experiences with me and my classmates after the Indie Game movie last night. I really appreciated your advice on the risks/rewards associated with indie game development, and how taking risks during one’s younger years can be a good time to develop a game idea of your own. Thank you again and enjoy the rest of the conference! While this may be true, Justin – and it likely is – you don’t speak for Mr. Blow. For all you know, he in fact *has* worked out some sort of release schedule. Though unlikely, keep in mind that Blow has proven himself to be unpredictable, which is part of what makes him such an intriguing and exciting developer to watch and read about. Yeah, I wasn’t trying to speak for Jonathan. I just wanted to provide an answer and some sort of help or info. Jonathan was not going to answer anyway so I just wanted to help Adam and let him knew what I know. I just wanted to help. all kidding aside… i’ve never heard anybody complain about a game being too long. Mr. Blow, you are a genious sir. I’d like to see the minimum game to not go over that 10-15 hour goal you set, but make the whole game, including the unnecessary puzzles as long as you want. Length makes it funner. See, I don’t think there’s anything wrong with a game being short. Braid was pretty short. Limbo only took two or three hours to complete, which is the same amount of time you spent watching a movie, and there’s absolutely nothing wrong with that. If the core of the experience is meant from the start to be compressed, then a game’s length is not something to worry about: For instance, Mass Effect 2 can take the average player over 30 hours to finish, and since that’s basically what the developers intended the length to be, then every hour of the game is enjoyable. So if you want to cut the game’s length so that the core experience can be played in less than nine hours, you should probably leave the other puzzles in optionally, but with a purpose to them, not just the puzzles themselves. Like the stars in Braid: The pleasure of solving the puzzles was a nice experience in and of itself, but what really drove most players to seek the stars was the “alternate ending” to the game. Even if it’s just a small statue or some bits of text that can be sought for finishing substantial amounts of puzzles additional to the core experience. I’m pretty sure you’ve already thought about this, and, like you said above, you;ll probably not cut away entirely bits of the game that are already there. Still, it would be tragic if you did.